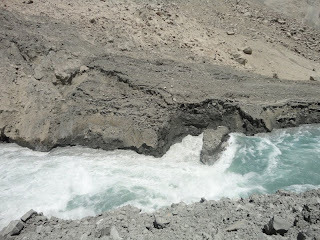 Dave Petley reports that there has been a decision to blast out some of the rocks in the channel at Attabad, but there is no information about which boulders are to be blasted. The large "boulder" at the top of the spillway is shown at the right. There has been considerable erosion around it in the past few days. For those who raft in the Grand Canyon, the image conjures up nightmares of the bad waves of Lava Falls in the Grand Canyon! There is, however, a second big boulder downstream and it's not clear to me that blasting the first one will do anything but move the choke point downstream to this boulder. 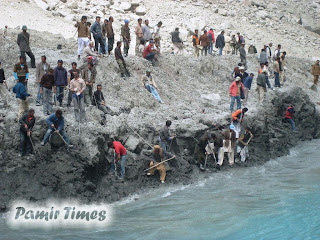 The frustrated displaced people at Attabad have begun taking the situation into their own hands, returning to the landslide and trying to widen the channel by hand as shown in the photo. This is an extremely dangerous situation, not only because of the ever-present dangers of landslides but because removal of material at the toe of the sides of the channel can destabilize it and cause collapse onto the workers. The Pamir times describes the social unrest and conflict with authorities as this unfolds. It also has a gallery of pictures of the work. An indication of the social situation is a quote from the Home Secretary "Those widening the spillway are agents of the enemies of Pakistan." 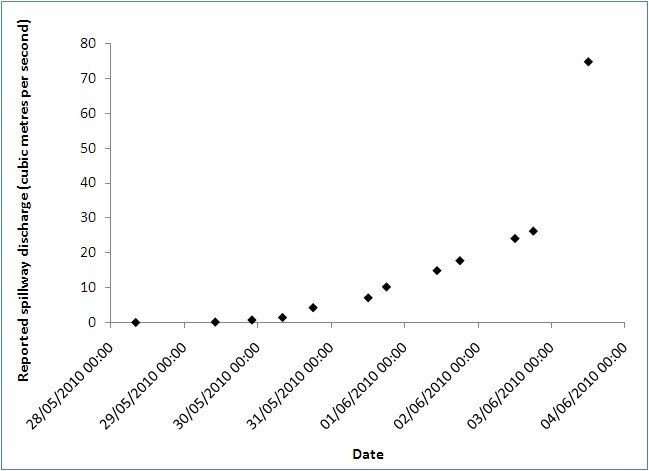 Since we are about half way between June 3 and June 26, this suggests that the spillway is currently only experiencing 20-50% of the peak discharges, and that the flow will increase inexorably over the next month. Photograph from the Oliver Daily News, June 17, 2010. Also on Dave's Landslide Blog on the same day. 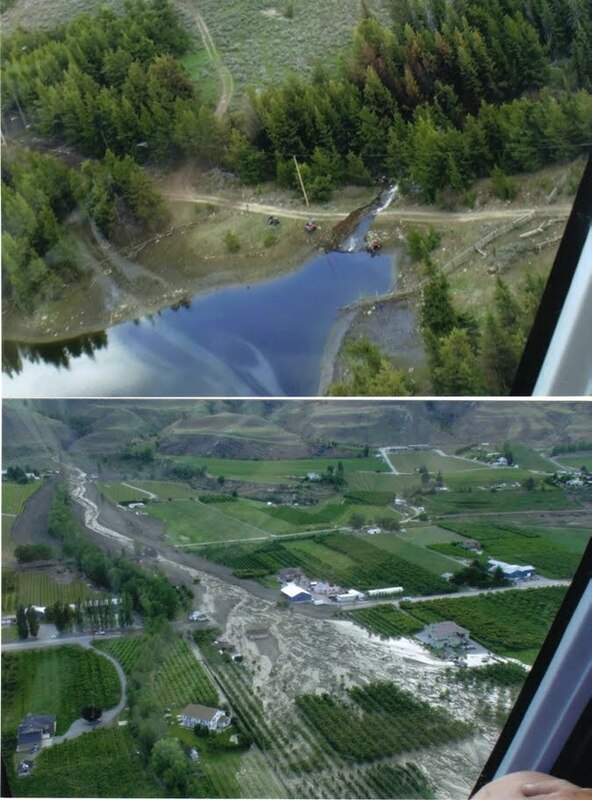 New air photos posted on Dave's Landslide Blog show that the landslide in Oliver last Sunday was triggered by the overtopping and eventual failure of a small earthen dam high up in the catchment basin. Rural areas all over the world are littered with these earthen dams (simply piles of soil) and many are old ill-maintained. In this case, hikers had warned authorities two days prior to the failure that the lake behind the dam was overflowing. The dam subsequently failed through the breach shown in the center of the upper photograph. Authorities did not warn those downstream, and there are now demands that there be compensation. An investigation is underway. In other news today, a wall in a mining pit in Tasmania collapsed, creating a huge rockslide. 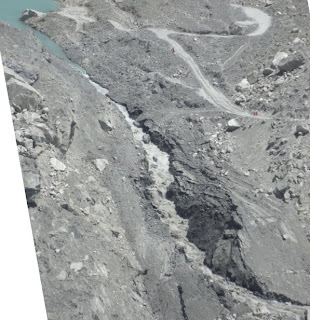 And, I've found another very interesting landslide blog in Darjeeling, India, "Save the Hills". 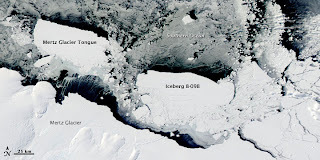 Image from NASA's MODIS on the Aqua satellite, taken March 11, 2010. Image is true-color. Strong winds can occur when cold dense air descends down a glacier or ice sheet. The winds can be hurricane speed, but more commonly are about 10 knots. These winds are variously termed katabatic, gravity, or mountain winds. The name originated from the Greek word katabatikos, which means "going downhill." In the Antarctic these winds then blow across the ocean water, producing ice crystals on the surface (the blue-gray areas of the photo in the area labeled "Southern Ocean). The winds are moving from the lower left toward the upper right. The winds then push the newly formed sea ice toward the north. Drifting icebergs (the bright white fragments) interrupt the flow of the winds, blocking the ice formation in small areas on their leeward sides (dark areas are open water). Related article at NASA Earth Observatory. The geyser eruptions are triggered when Mentos are dropped into the Diet Coke. The rough surface of the Mentos triggers nucleation and growth of bubbles of carbon dioxide (CO2), and the expansion of the gas drives the foamy mess out of the Coke bottle. Diet Coke is the preferred beverage because it's not as sticky as the other options when it sprays all over the place! 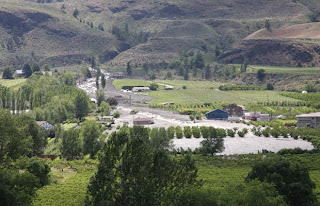 The town of Oliver in the Okanagan, a rural area of British Columbia, Canada, was hit by a mud and debris flow yesterday, June 13. This flow originated in an incised canyon where Testalinda Creek flowed from a lake. Five homes were swept off their foundation, there were no injuries. 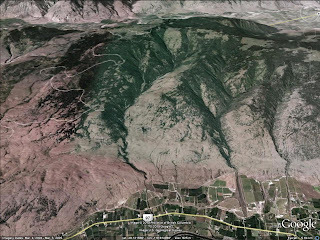 As pointed out on Dave's Landslide Blog (on June 14), Oliver sits on a small debris fan, shown as the triangular area just above the highway 97 sign in this photo from Google Earth (click on the photo to enlarge it so that you can actually see the debris fan). 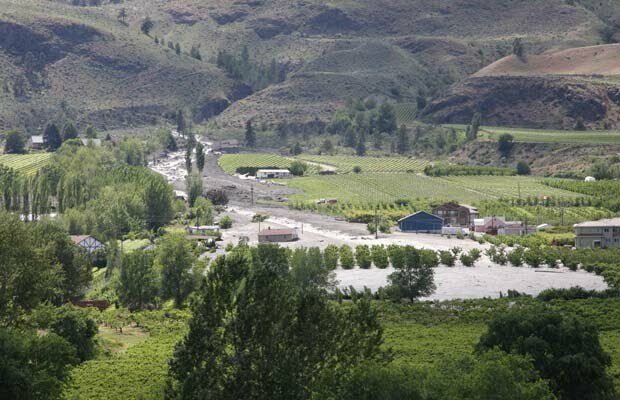 Upstream from Oliver is a lake, drained by Testalinda Creek which flows in a deeply incised canyon. 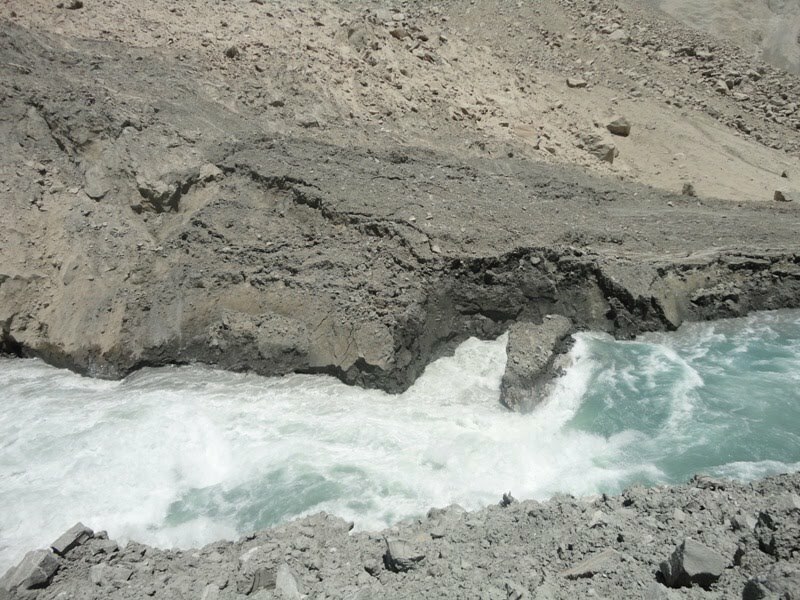 In such situations, debris can build up at the bottleneck in the canyon to effectively form a dam. When rain has saturated the soil, as has been the case this rainy summer, the debris pile can let loose and send a torrent of water, mud, and debris out into the surrounding country side. Sand volcanoes are perplexing features. 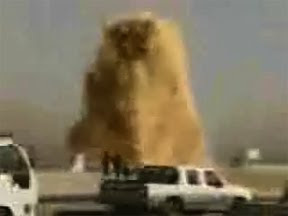 In researching them this morning, I came across an amazing video--a movie of a sand volcano in the making. It's on U-tube, little documentation, so I don't know if this is actually a drilled well that is blowing sand out, or if it's natural. (You may need to search around on the linked page to make the video work, but it's an interesting page to explore anyhow!) The comments posted with it say that this is a "sand injective" or "sand volcano" taking place by the side of the road in Saudi Arabia. It was taken on a mobile phone and posted on YouTube, original user unknown. A recommended reference on sand inectites is Hurst, A. and Cartwright, J.A., 2007. "Sand injectites: implications for hydrocarbon exploration and production. AAPG Memoir, Tulsa, 274 p.
Time magazine on-line posted 12 photos from an "art in science" competition today, and I found this one to be really neat! It's a desert hare struggling to stay warm on a cold morning (left) by closing down into a position that minimizes the surface to volume ratio and preserves body heat. 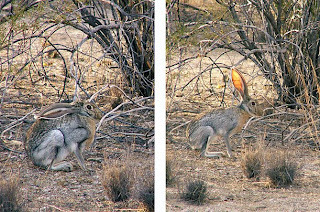 When the sun warmed him up (right) he resumed the more normal position in which his large ears and extended limbs can function to get rid of the excess body heat normally encountered in desert environments. 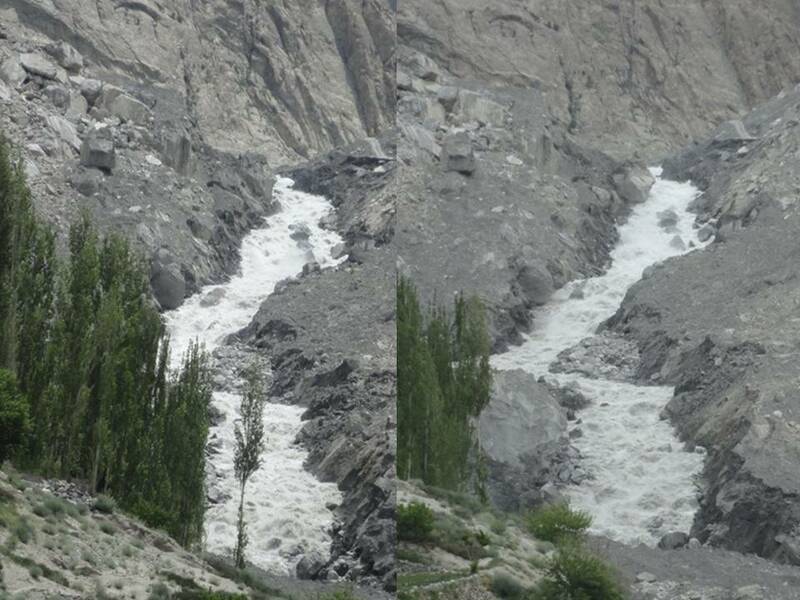 Photos of the situation at Attabad on June 7 (left) and June 8 (right). The rate of erosion of the spillway has diminished during the past week as flow out of the lake now equals flow into the lake. However, the melt season has not yet begun and discharges will have to increase over the summer. Apparently authorities are contemplating whether or not to dynamite the region at the top where a large boulder constricts the flow. Such a move would be very controversial and potentially dangerous, with the possibility of triggering more landslides in this area very real. One hazard now is that a landslide into the lake will cause overtopping of the spillway and rapid erosion. There is a new video of the river cutting through the landslide at Attabad. Photo from NASA press release. 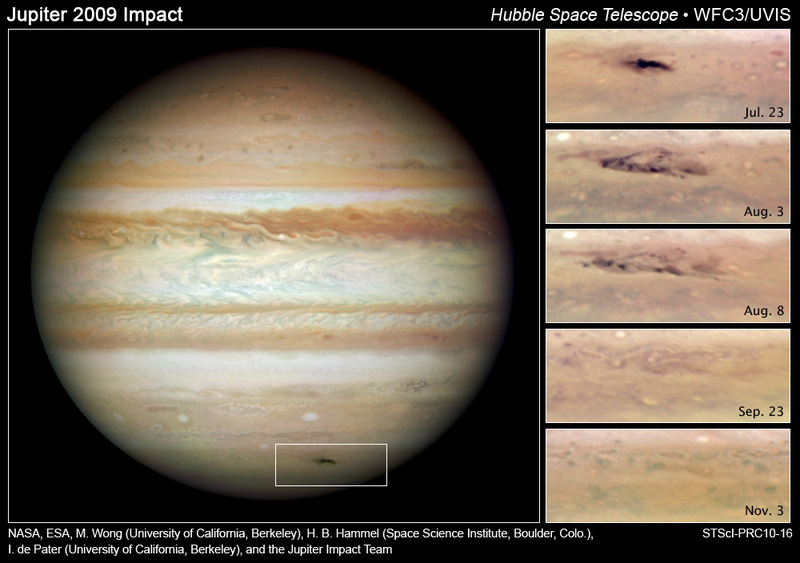 On July 19, 2009, an object struck Jupiter, leaving a scar the size of the Pacific Ocean. 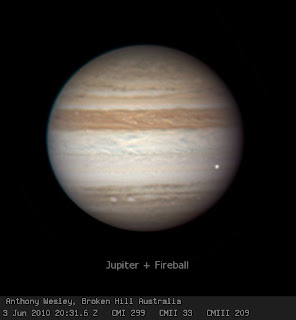 This is not the first time that impacts on Jupiter have been observed. During the same week, 15 years earlier, pieces of Comet Shoemaker-Levy repeatedly hit the planet. The elongated shape of the impact site suggests that the impact was from a relatively shallow angle. By comparing images of the 1994 comet impact and the 2009 impact, astronomers noted distinct differences. 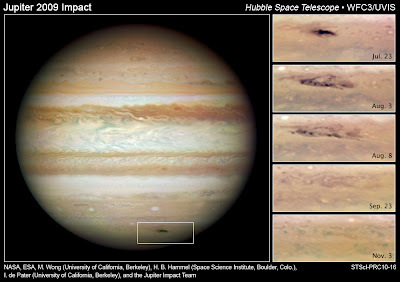 In the 1994 impact sites, ultraviolet images from the Hubble spacecraft showed a distinct halo around the impact sites. This was interpreted as evidence of fine dust arising from the (dusty, icy) comet as it impacted the atmosphere of Jupiter. In contrast, the 2009 images show no halo, suggesting a lack of fine particles. The 2009 impact site disappeared much more rapidly than the 1994 site, and this has also been taken as evidence for a lack of fine particles. The implication is that the impact may have been by a solid, rocky asteroid rather than a dusty icy comet. This study appeared in the June 1, 2009, issue of The Astrophysical Journal Letters. The role of noncondensible gases in the blowouts of geothermal and hydrocarbon wells is not widely recognized. 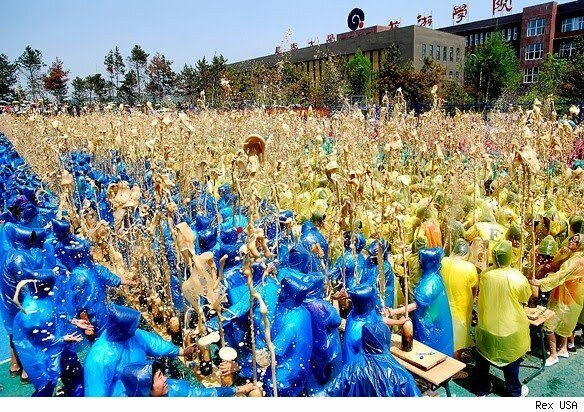 Here's a most recent event of one near the town of my birth. Here's the next day's notice of severe weather! Gee, when we were kids we never had any clue that life was so exciting there! 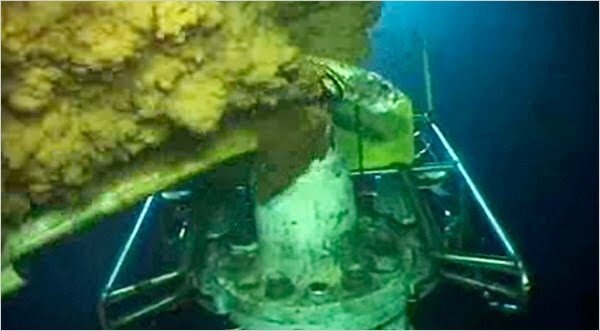 British Petroleum engineers have successfully installed a cover on the leaking well and are trying to siphon oil to surface ships. 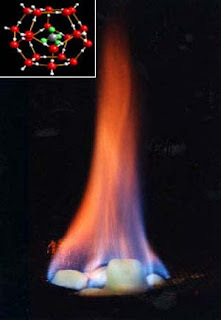 They have been proceeding cautiously because their previous attempt with this procedure got clogged with a nasty form of ice called "methane hydrate" or "methane clathrate". Water ice is capable of absorbing an amazing amount of some gases into its structure in "cages". A typical clathrate cage is shown in the inset of this image of a methane clathrate burning. Yes, you can set ice on fire!. The gas burns off leaving the ice structures behind. The gas molecules are stored in cages of H2O molecules, and it's quite amazing how much gas can be stored in these cages. Clathrates are a major reservoirs of natural gas globally, as shown by the map of clathrate deposits. The dissociation of this weird form of ice has been implicated in everything from the disappearance of ships in the Bermuda Triangle to sudden climate change. It's been proposed that sudden "burps" of methane gases from clathrates in the Bermuda Triangle have changed the density of the water column so that ships that were floating on the water suddenly found themselves floating on "gassy water" and lost buoyancy, sinking to the bottom. (One thing nice about this blog is that I don't have to provide rigorous referencing!!) 55 million years ago, the Paleocene/Eocene boundary, there was a dramatic climate change that some have argued was due to a sudden methane influx into the atmosphere due to decomposition of clathrates. The cause of decomposition is unknown, but theories relevant to the current climate crisis are abundant. I found this article by Galvin Schmidt to be a thoughtful analysis. I will rarely post a fairly lengthy direct quote here, but this one is worth it and from an expert, Cutler Cleveland. He was a student of Bruce Hannon's here, and is a professor at BU. We used his sustainability text in our sustainability course. "Some reports in the media attempt to downplay the significance of the release of oil from the Deepwater Horizon accident by arguing that natural oil seeps release large volumes of oil to the ocean, so why worry? Lets look at the numbers. Natural seeps can be thought of as natural springs from which liquid and gaseous hydrocarbons (hydrogen-carbon compounds) leak out of the ground. Oil seeps are fed by natural underground accumulations of oil and natural gas. Satellite images have identified hundreds of areas where oil is likely to seep from the Earth's crust into the waters of the Gulf of Mexico. These seeps occur over a wide range of the 615,000 mi² (1.6 million km²) Gulf. 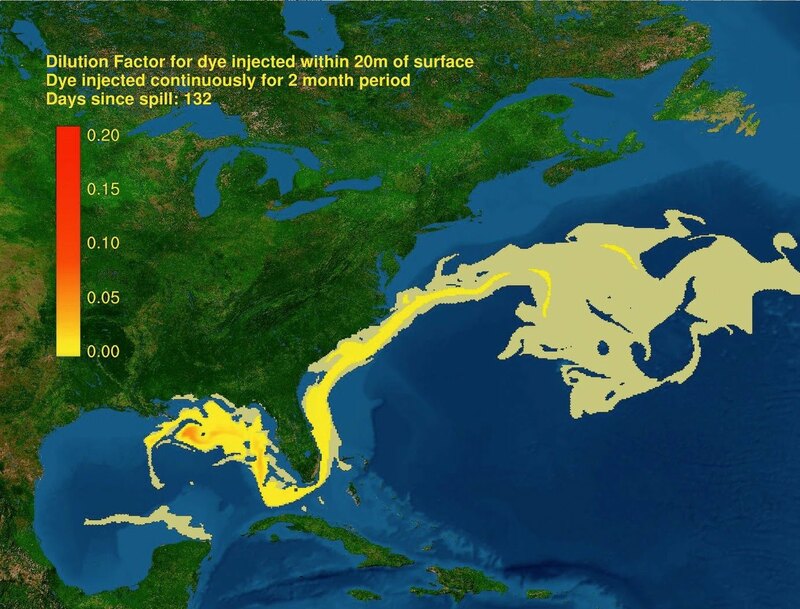 A 2003 study by the National Research Council and a 2009 report by oil spill expert Dagmar Schmidt Etkin indicate that between 560,000 and 1,400,000 barrels per year (1,534 to 3,835 barrels per day) seep into the Gulf of Mexico from natural sources. Dozens of natural seeps have been identified off the coasts of Louisiana and Texas, some in the region of the Deepwater Horizon site. These natural seeps are quasi-continuous or chronic inputs that represent a "background" rate of oil input that have been in existence for hundreds or thousands of years. As the term "seep" implies, the rate of oil release from these sources is much smaller than human spills that often release large, concentrated pulses of oil. One of the largest and most intensively studied seepage areas lies off Coal Oil Point, in Santa Barbara County, California. Individual seeps in this area release an estimated 80 to 100 barrels (3,360 to 4,200 gallons) of oil per day; Deepwater Horizon is releasing 12,000 to 19,000 barrels per day. The Deepwater Horizon site releases 3 to 12 times the oil per day compared to that released by natural seeps across the entire Gulf of Mexico. By May 30, the Deepwater Horizon site had released between 468,000 and 741,000 barrels of oil, compared to 60,000 to 150,000 barrels from natural seeps across the entire Gulf of Mexico over the same 39 day period. Natural seeps are not constantly active; the volume of oil released can vary considerably throughout the day and from day to day. As a result, only a small area around the source is actually exposed to "fresh" non-degraded oil, which is its most toxic state. Marine and coastal organisms and ecosystems presumably have adapted to the natural rate of oil input. Indeed, most organisms living in the regions near natural oil seeps have no special adaptations to the oil. Researchers at Woods Hole Oceanographic Institute and the University of California/Santa Barbara studied natural seeps off the coast of California. They found that as the oil moved upwards in the water column, a wide range of microbes consume the oil and produce intermediate products, and that those intermediate products are then converted by another group of microbes to natural gas and other compounds. Their research suggests that oil from natural seeps normally stays in the water for between ten hours to five days. Oil that does make it to the surface from natural seeps can spread out very widely. One gallon of oil can spread out to cover more than a full square mile, forming an extremely thin film on the surface, about one-hundredth of a millimeter thick. Under these conditions, the oil is not hazardous. Some of the oil in that thin sheen evaporates within seconds or minutes after it reaches the surface. A sudden, concentrated and massive pulse of oil from an event such as the Deepwater Horizon disaster presents a fundamentally more acute stress to marine and coastal systems. The amount, rate and spatial concentration of crude oil released from such an event overwhelm the natural mechanisms of oil dispersal and breakdown, producing the significant ecological effects that we observe." Clester, S.M., J.S. Hornafius, J. Scepan and J.E. Estes, Quantification of the relationship between natural gas seepage rates and surface oil volume in the Santa Barbara Channel, EOS Transactions of the American Geophysical Union 77 (1996), p. 420. Farwell, Christopher, Christopher M. Reddy, Emily Peacock, Robert K. Nelson, Libe Washburn and David L. Valentine, Weathering and the Fallout Plume of Heavy Oil from Strong Petroleum Seeps Near Coal Oil Point, CA, Environ. Sci. Technol., 2009, 43 (10), pp 3542–3548. National Research Council Committee on Oil in the Sea. 2003.Oil in the Sea III: Inputs, Fates, and Effects. National Research Council Ocean Studies Board and Marine Board Divisions of Earth and Life Studies and Transportation Research Board. National Academy Press, Washington, DC, USA. 265 pp. Schmidt Etkin, Dagmar, Analysis of U.S. Oil Spillage, API Publication 356, American Petroleum Institute, August 2009, Washington, D.C.
Wardlaw, George D., J. Samuel Arey, Christopher M. Reddy, Robert K. Nelson, G. Todd Ventura and David L. Valentine, Disentangling Oil Weathering at a Marine Seep Using GC×GC: Broad Metabolic Specificity Accompanies Subsurface Petroleum Biodegradation, Environ. Sci. Technol., 2008, 42 (19), pp 7166–7173. Dave Petley continues to inform the world of the events at Attabad. Compare this image of the situation yesterday with the photo below of the situation today. It is helpful to locate a few markers: (1) the white rock projecting toward the waterfall from a position just to the right of the low point in the road at the top of the photo; (2) the prominence at the top left where it looks like a large rock sticks out into the lake just where it starts flowing into the spillway, and (3) two large rocks on the slope on the left side of the steep waterfall. The upper rock closest to the water is grey with a white "nose", and the other rock (directly below it in the photo) is flat and white. (4) There is also a convenient marker, a black vertical line toward the bottom center of the photograph. Using these markers, you can see that the water from the lake is accelerating toward the waterfall just above the "grey" rock. The waterfall over the steepest part of the slope is turbulent, frothy, and has no exposed rocks to speak of. The gully at the bottom of the waterfall is an area of erosion. Compared to the next photo taken at a slightly different angle, the water disappears behind a ridge, but it's not possible to see what is going on behind this ridge. Now look at today's picture. For scale, there are two people just above the white marker rock on the right side of the river. 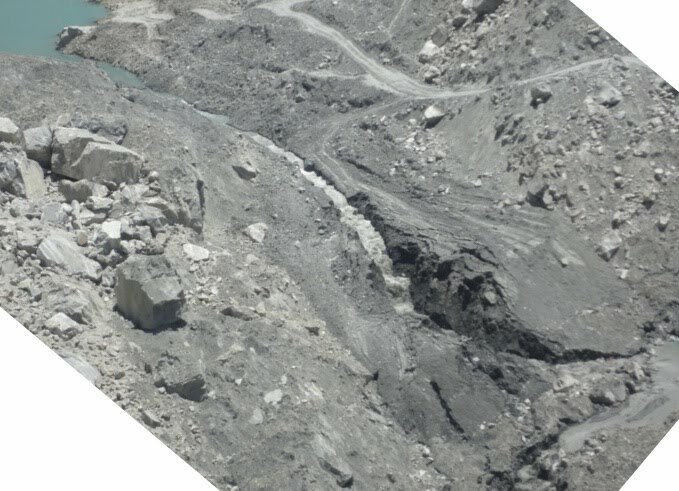 The upstream conditions where the lake starts to flow into the spillway are about the same, but the situation is changing dramatically between the grey boulder on the right and the pointy rock over by the road. The channel has noticeably widened, exposing rocks in the channel. A critical place to look is at the changes in the channel between the three rocks that I've defined as reference points. It is widening significantly in this area. Dave proposes that the water is now eroding the landslide itself instead of just the spillway materials. He says "The waterfall ....has create(d) a set of rapids that are clearly eroding back up the channel. The head of the rapids are close to the saddle. The key point is probably the location where the channel became notably steeper--this is where scour accelerates. Once this point is reached and passes the saddle, the rate of flow will start to increase and we might well see the breach developing. 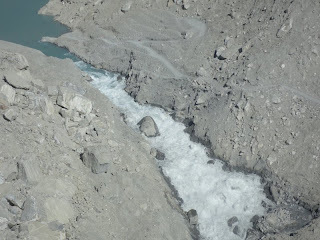 Unless the top of the rapids is being impeded by a large boulder or similar, this will probably develop quite quickly....downstream communities need to be prepared for a rapid breach." There are three ways that this channel is eroding: expansion of the width, deepening of the channel by bottom erosion, and retrogressive erosion. I was fortunate enough to be able to document the processes that Dave is describing today in a study of one of the rapids in the Grand Canyon in 1983. A debris flow (technically different than a landslide) roared down Crystal Creek in 1966 and clogged the Colorado River, forming one of the most difficult, and deadly, rapids on the Colorado. Discharges through the Grand Canyon are controlled by the discharges through Glen Canyon Dam. In 1983 a series of events forced the Bureau of Reclamation to increase the discharges to three times the level that had ever passed through Crystal Rapids. 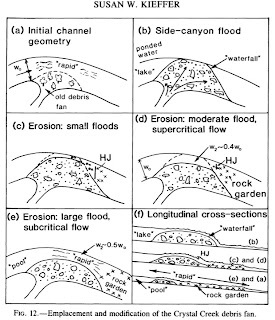 The cartoon on the upper right shows what happened, and happens as floods of different sizes attack barriers such as debris flows or landslides. In the Grand Canyon, debris flows episodically block the path of the Colorado, and so the starting point for the erosion is arbitrary. 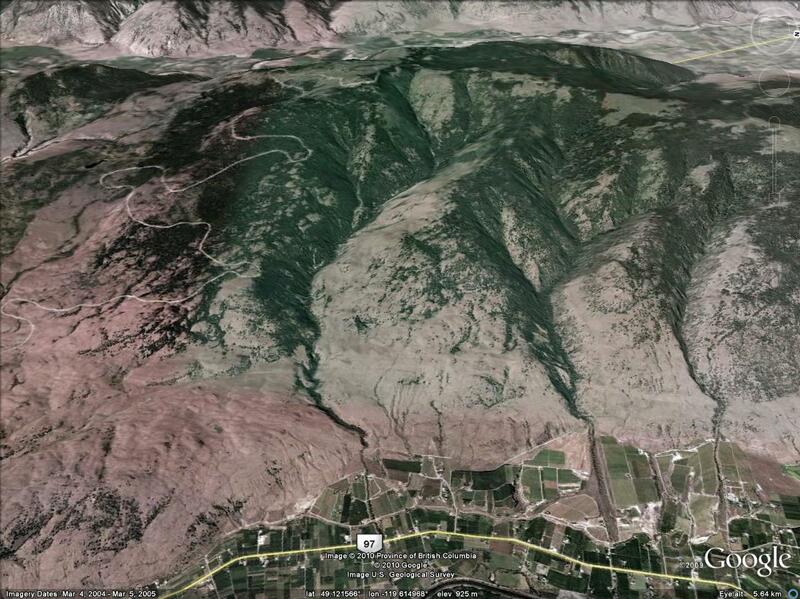 At low discharges, the river will erode a relatively narrow channel through the saddle point of the debris flow. At the rapids of the Colorado, this saddle point is always on the opposite side of the river from the side-canyon of origin of the debris flow. However, landslides can have such high velocities and so much mass that they shoot across the main river channel and bank up against the far side. In this case, the saddle point isn't necessarily against the far wall as shown here, but can be in the middle or even proximal part of the landslide. Increasing discharges widen the channel, and scour out the bottom (not well shown in these cartoons). 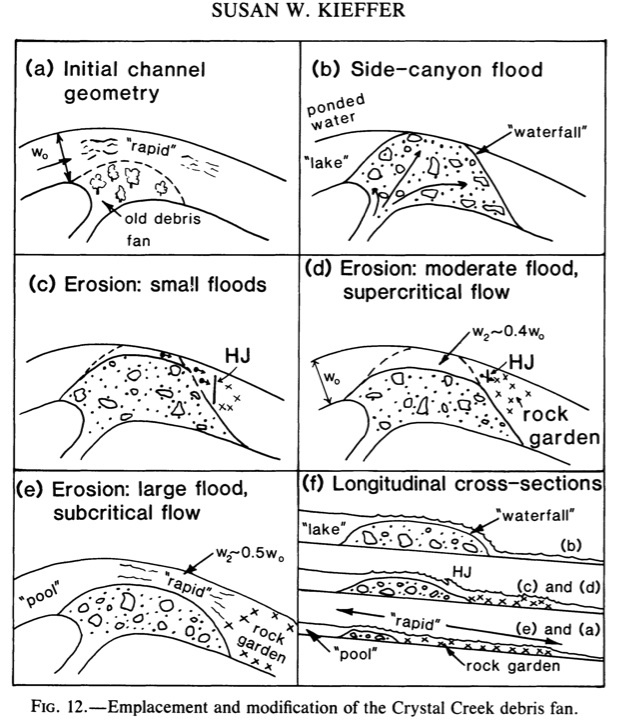 There can also be erosion through the debris flow either from the upstream side (not likely in most cases because flow velocities are low on the upstream side) or the downstream side. The latter is the regressive failure, also called headward erosion, that seems to be dominating at Attabad. When the headward erosion reaches the saddle point the floor of the channel will be dramatically lowered at this critical point. Water velocities will increase causing erosion to increase, and this is the time when the landslide lake may pour out and into the valley of the Hunzen River. We who are watching this unfold hope that the people of the Hunza Valley are safe. Sometimes it's just worth taking a break from normal science and watching something captivating. A short version of this video of a bear affectionately named "Kung Fu" was circulated the past few days, drawing a lot of press coverage. The controversy was whether or not this is all a fake. This video is a longer, edited version put out to prove that this bear and his act are real! Maybe we tool-wielding homo sapiens evolved from bears? Go, Kung Fu Bear! !